If you wish to customize the default labels of the chart series, you could use Label Definition. To see labels in the series you have to set ShowLabels="True"
More than one Label Definition can be set on each series. You have to add ChartSeriesLabelDefinition item to the LabelDefinitions collection of the chart series (see the Examle below). Binding: Gets or sets the DataPointBinding instance that will retrieve the content of each label. Format: Gets or sets the string used to format the label content, using the String.Format method. 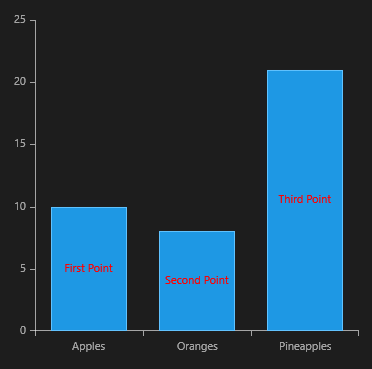 Margin: Gets or sets the offset of each label from the four box edges. HorizontalAlignment: Gets or sets the horizontal alignment of each label relative to the DataPoint it is associated with. VerticalAlignment: Gets or sets the vertical alignmentof each label relative to the DataPoint it is associated with. Template: Gets or sets the DataTemplate instance that may be used to define custom labels. TemplateSelector: Gets or sets the DataTemplateSelector instance that may be used to provide context-specific data templates, depending on the provided DataPoint. DefaultVisualStyle: Gets or sets the Style instance that defines the default appearance of the labels. The Style should arget the TextBlock type. Strategy: Gets or sets a custom ChartSeriesLabelStrategy instance that may be used to override the labels' appearance, content and layout. This example shows how to bind the label's content to a custom property from your business model. Two Label Definitions are added for each data item.